Our BLDC motors are made of the highest quality materials, using latest CNC machines. All other components (starting with magnets, ending with winding wire) are selected with emphasis on maximum performance, minimum weight and long service life. All motors are equipped with sensors for reading the rotor’s magnetic field, which is necessary for efficient controlling of the motor, especially for high values of torque and for low-speed start-up. This feature is particularly needed for example use a folding propellers, where the predefined algorithm of start-up is necessary for continuous and sensitive opening. In land applications help with smooth acceleration and regeneration braking. Of course, there is a feature of monitoring the motor temperature and option for setting the temperature limits. Used controllers uses the best available power MOSFETs or IGBT modules for higher voltage and synchronous PWM for achieve very high efficiency. They feature very advanced (state-of-the-art) algorithms of moor control as well as safety of operation. Controller concept is based on a long experience with control of both sensor less and sensor BLDC (resp. PMSM) motors in very heavy and demanding operating conditions. For driving are used very powerful 32-bit ARM microcontrollers. Systems can work in all battery type (NiCd, NiMH, A123, Lipol, Li-Ion, LiFePo4, Pb,…) may be assembled of up to 48V to 120V. When being operated, the overall drive system may be monitored by telemetry, which provides, besides monitoring of battery capacity, many other details on the whole driving system, the most important ones are following: Voltage, Current, RPM, Temp. CONT, MOT, BAT, Power, Voltage each cell 1- 17. 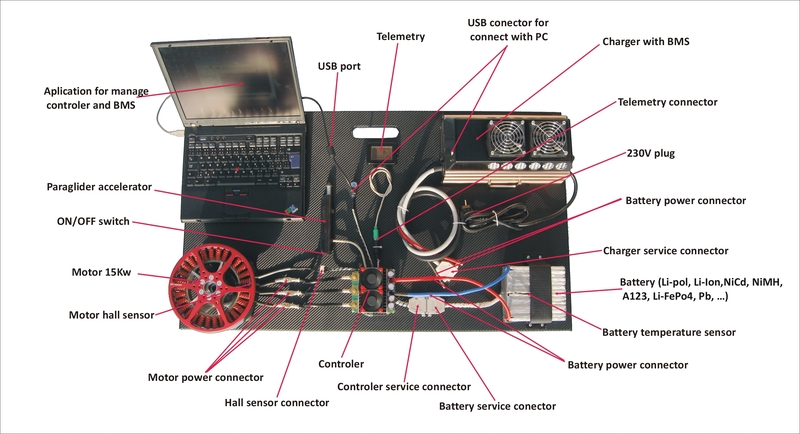 The entire driving and charging system can be easily set, monitored and updated via PC application and USB port, and of course, the operation history is saved in the internal black box to be downloaded and assessed later. Intelligent charger provided and BMS, (battery management system) ensures very sensitive balancing during the charging process. Used BMS provides „alignment“ of the cells during the charging process with the accuracy of 30mV !! which is necessary for safe charging and long service life of the battery. 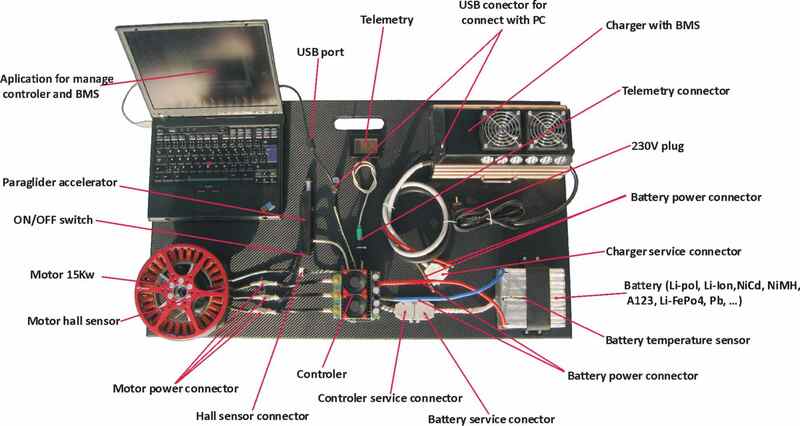 Just an example is the system used on paragliding backpacks.